Private Coasteer, Cornwall – when coasteering gets personal. Leap straight into action with our wet and wild Coasteering for Private Groups in Cornwall. Specifically designed around the capability of your group, your private party will cover more ground and get close-quarter guidance and advice from your coasteering instructors. Why choose our Private Coasteers? You’ll get kitted out in a wetsuit, buoyancy aid and helmet in our on-site changing room, with storage for all your belongings, before exploring a side to the dramatic craggy cliffs of Newquay you may never know existed complete with smugglers’ caves and incredible marine life. Whether you’re an adventure loving family, adrenalin-addicted bunch of mates or environmentally focussed group, you will explore these cultural and historical landmarks along the town’s cliffs whilst surrounded by native wildlife. As a private group you’ll do it at your own pace. With a focus on the areas that you enjoy the most. You’ll wild swim through whirlpools, ride natural rapids in coastal sluice currents, climb beautiful coves and maybe spot a seal or two. 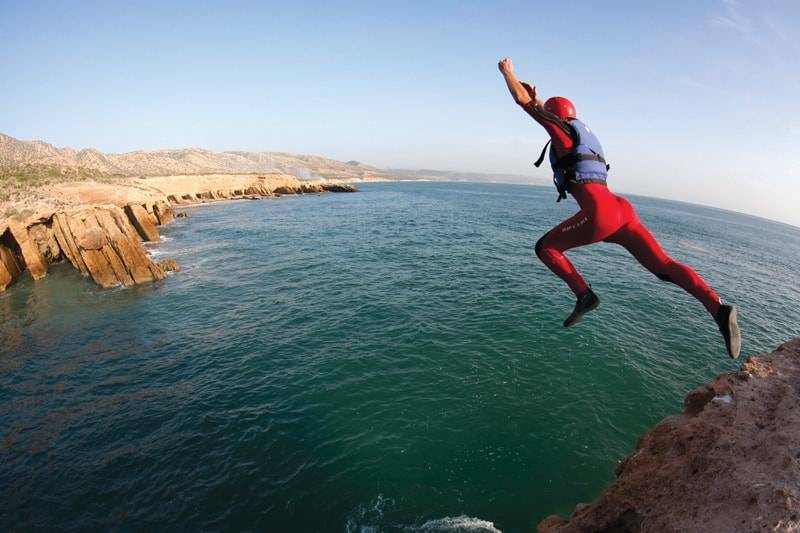 Leap into deep-water plunge pools from natural ledges, tackle rock traverses, swim through fast-running gullies. This is the ultimate adventure to do with your own private group! Our reviews on Tripadvisor for Coastering at the NAC rank us as number one for Cornwall activities and we’re proud golden winners of the Cornish Tourism awards. Our Private Coasteers are unique to Newquay activity Centre and will be an adventure to remember!